China Transport Billion Mine Network As The New Information Consumption Demonstration Project Of The Ministry Of Industry And Information Technology Was Reported By The District Newspaper "Liaohe First Sound"
On June 29, 2018, Jining National High-tech Zone, "Liaohe First Sound", Issue No. 67, 2018, C02, published a paper entitled "China Transport billion Mine Network project was successfully selected by the Ministry of Industry and Information Technology, 2018 New Information Consumption Demonstration Project". The coal group billion mine network project has carried out key reports and has been widely praised and affirmed by all walks of life. 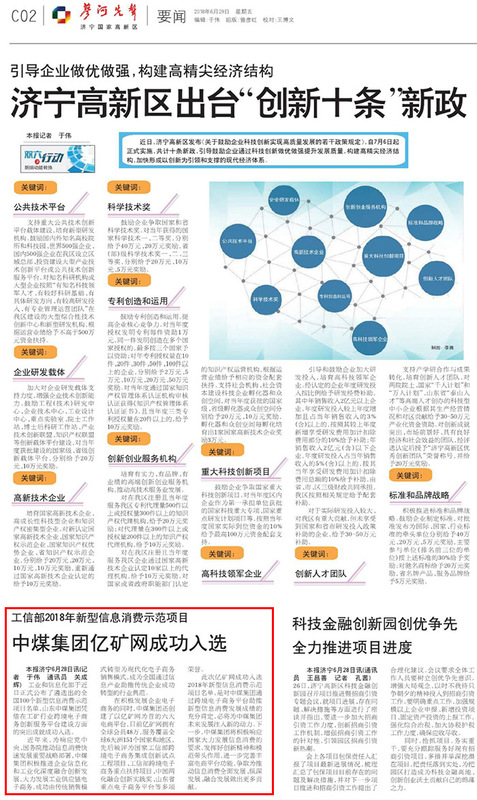 The article points out that in recent years, in response to the Party Central Committee and the State Council's promotion of an important strategic plan for promoting the rapid development of information consumption, China Coal actively promotes the deep integration and innovation of enterprise information and industrialization, vigorously develops the e-commerce of the industrial supply chain, and successfully transforms the traditional sales model. In order to modernize the e-commerce sales model, it has become an industry model for the nation's successful transformation of traditional enterprises through the information industry. Among them, China Transport has also established six major e-commerce platforms led by the billion-dollar network. Currently, the company has 480,000 members worldwide and its services cover 151 countries and regions on 6 continents. It has been rated as the cross-border electronic of the Ministry of Industry and Information Technology. Business integration innovation pilot project, engineering department cross-border e-commerce key support project, China's two-in-one integration innovation practice award, Shandong Province key e-commerce platform and many other honors. In recent years, China Coal’s innovation and development achievements in e-commerce, cross-border e-commerce, and e-commerce platform creation have attracted widespread attention from all sectors of society. CCTV, Shandong TV, Jining TV, Dazhong Daily, Qilu Evening News, Jining Many mainstream media such as the Daily, People’s Daily Online, Xinhuanet, China Youth Network, Sohu.com, Dazhongwang, Dongfang Shengcheng.com, and Jining.com have repeatedly reported on the Group’s innovation and development achievements, and many national and provincial leaders. Visiting and instructing our group in person has greatly promoted the development of the Group. In the next step, China Transport will actively respond to the country's vigorous development of information consumption requirements, give full play to the spirit of innovation and exemplary role, further improve the rich e-commerce platform functions, and strive to promote the full development of information consumption, in-depth development and integration of development to make more contribution!